Hi guys, welcome back to my blog! 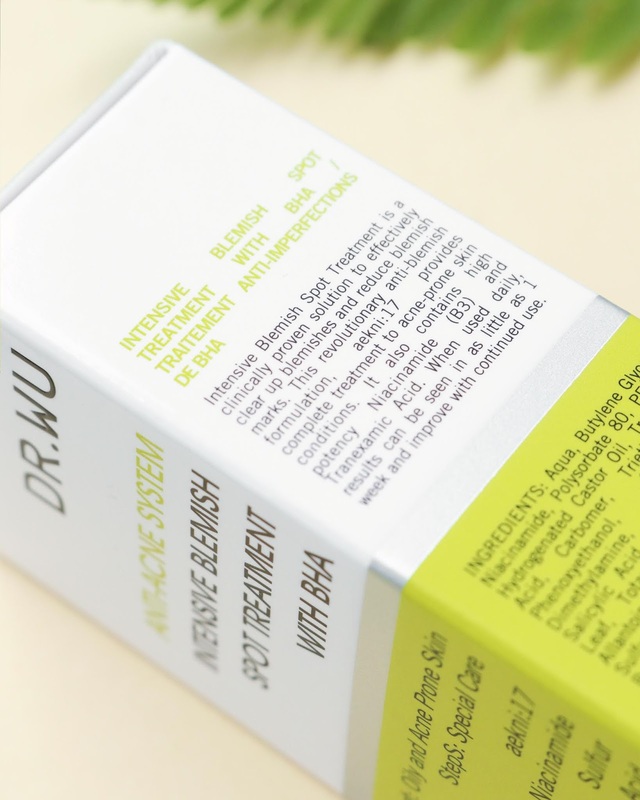 Today I'll be sharing about Dr. Wu's aekni:17 Anti-Acne System Intensive Blemish Spot Treatment with BHA. 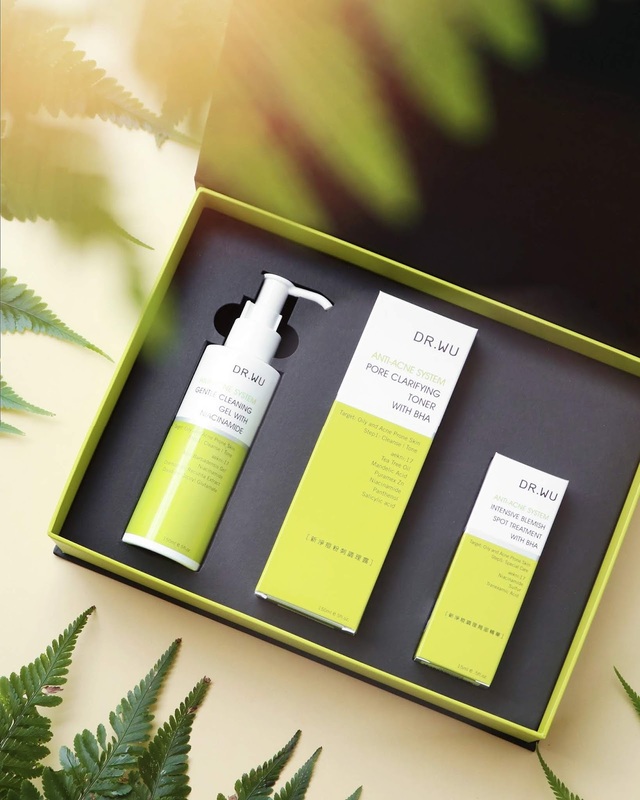 Dr. Wu is Taiwan's leading medical skincare brand, and their products are popular for having high concentrations of high-grade active ingredients, as well as no additives + no alcohol. I've seen them in stores ever since I was in high school, and I'm super happy to finally have a chance to try out their products! 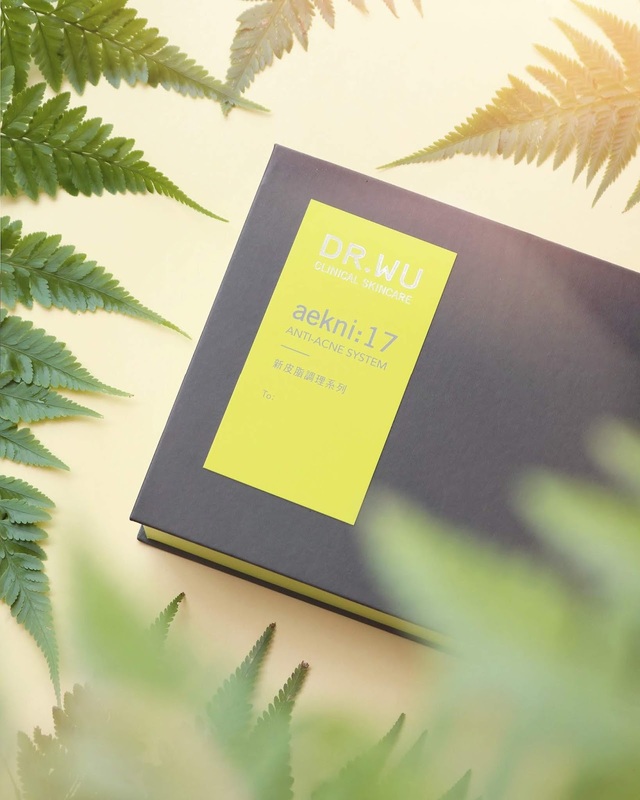 Containing an anti-acne formula that they call aekni:17 , the Anti-Acne System collection consists of 3 basic products to cover all the bases + 1 special treatment for extra care. 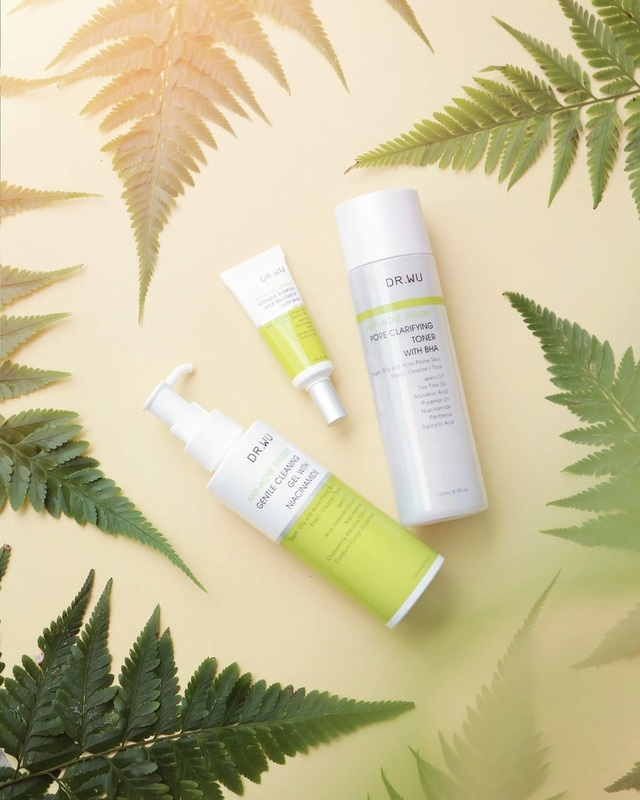 The products from the Anti-Acne System collection features 17 different active ingredients (like salicylic acid, tea tree oil and their special aekni:17 formula), and this special blend of active ingredients help to control acne & oil control, as well as soothe, moisturize and heal the skin. 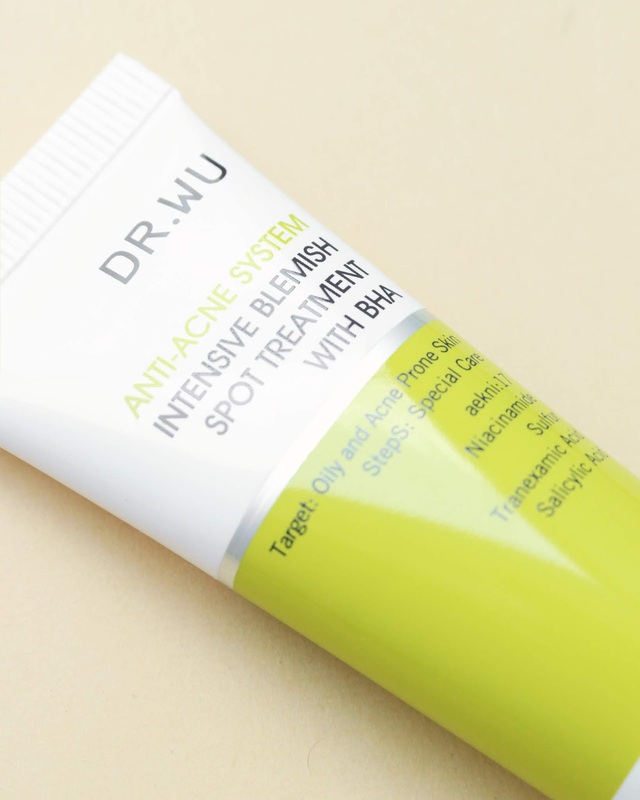 The Intensive Blemish Spot Treatment with BHA is a clinically proven solution for soothing blemishes and reducing blemish marks. 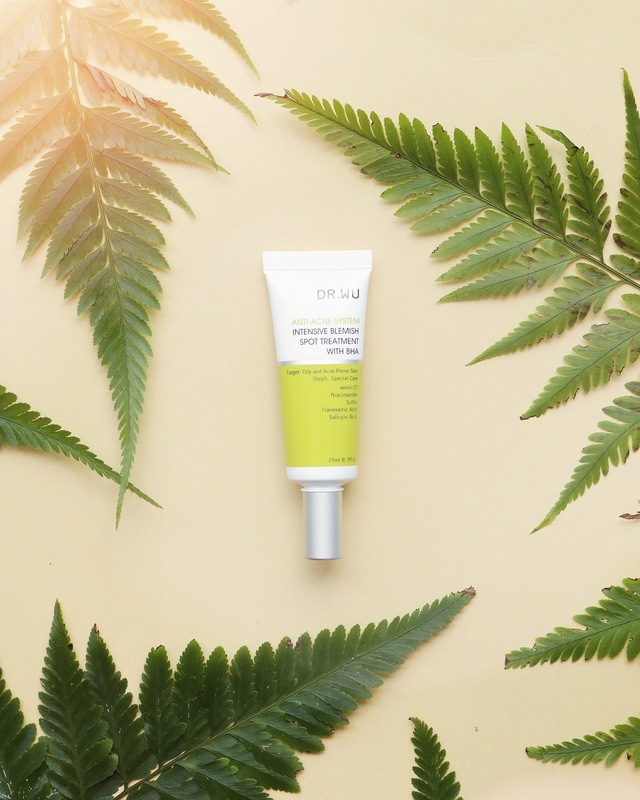 Containing highly potent Niacinamide and Tranexamic acid, this product evens out skin tone and visibly reduces marks left by blemishes. 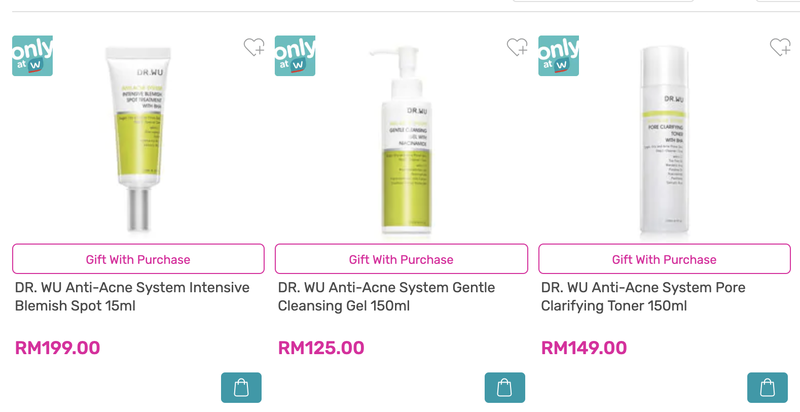 You can buy the full sized 15ml tube from Watsons for RM199. 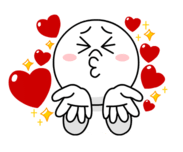 It's pretty up there in terms of price and is the most expensive among all the products in the aekni:17 line. 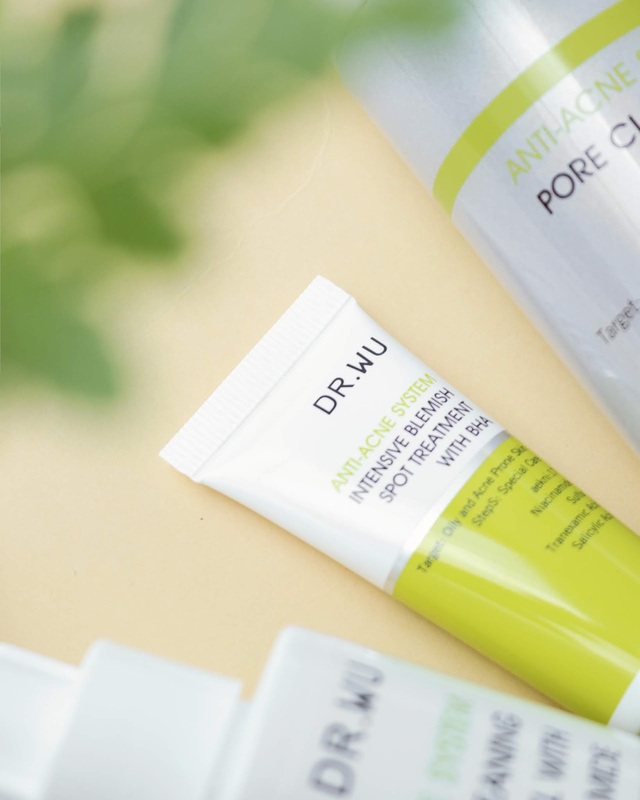 Dr Wu is considered on of the best and effective Taiwan skincare brands that use only high grade active ingredients, but is this super high price worth it? Read on to find out! The tube is small & compact, and I find that it dispenses product easily enough for me to control the product flow. 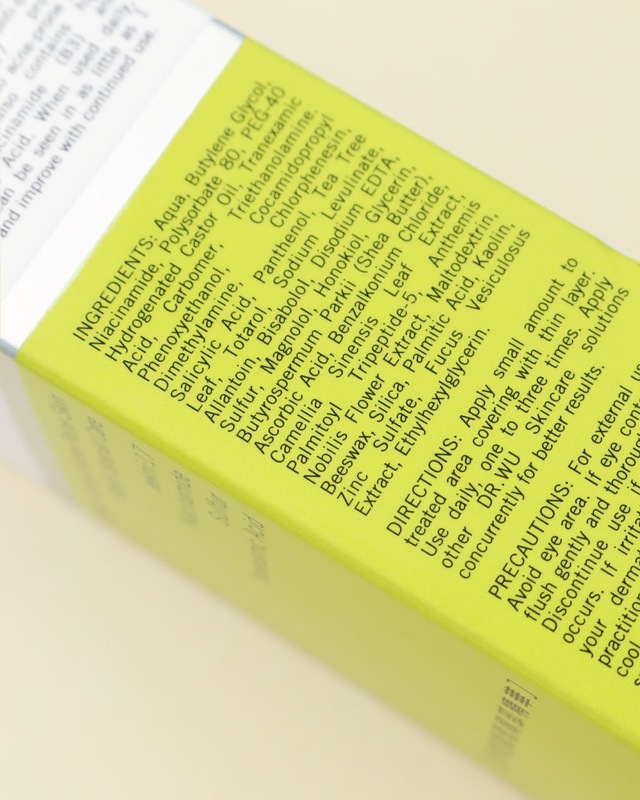 This product is paraben-free, sulfate-free, alcohol-free, silicone-free & EU allergen-free. 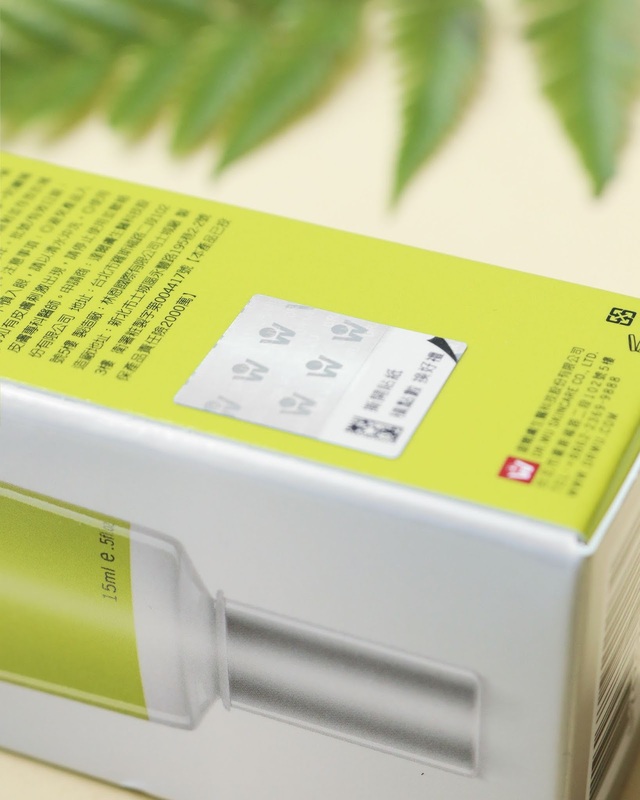 It has quite a unique list of ingredients which never usually see in Korean skincare. 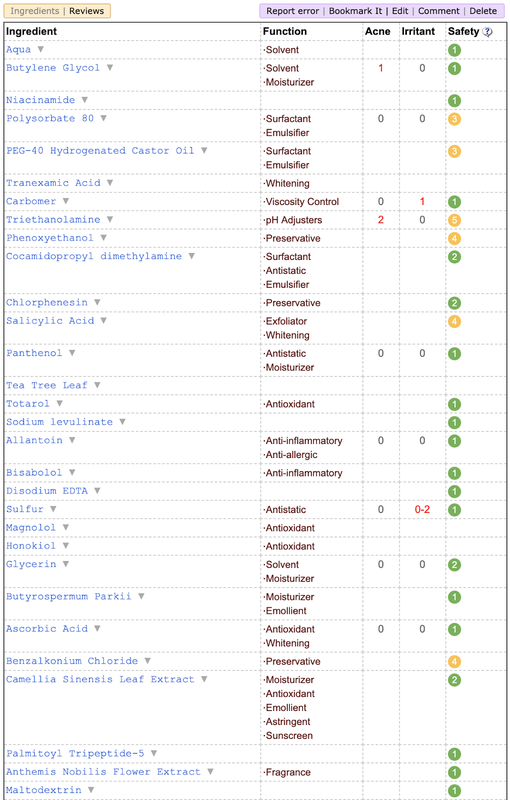 I think its these ingredients that make the product expensive, and they're the reason why this product is so potent as well. Some of the unique ingredients in this product which I've never seen before are Tranexamic Acid (a type of amino acid that helps with inflammation), Chlorphenesin (prevents bacteria infection), Totarol (antimicrobial & a potent anti-oxidant), Bisabolol (soothing), Magnolol (anti-inflammatory & de-stressing), Honokiol (a traditional ingredient used in eastern medicine which is anti-inflammatory and is an anti-oxidant) & Butyrospermum Parkii Anthemis Nobilis Flower Extract (skin-soothing & a antioxidant). 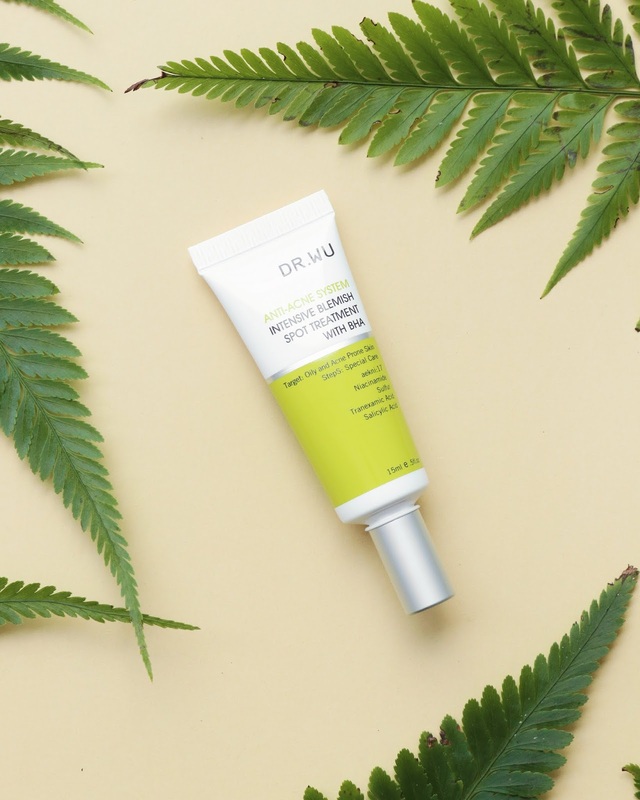 The ingredients in this treatment help to fight acne (Sulfur, Tea Tree Leaf Oil, Salicylic Acid), brighten the skin (Niacinamide, Vitamin C, Tranexamic acid, Alpha-Bisabolol) and promote wound healing (Panthenol, Alpha-Bisabolol). They're also good for all skin types! 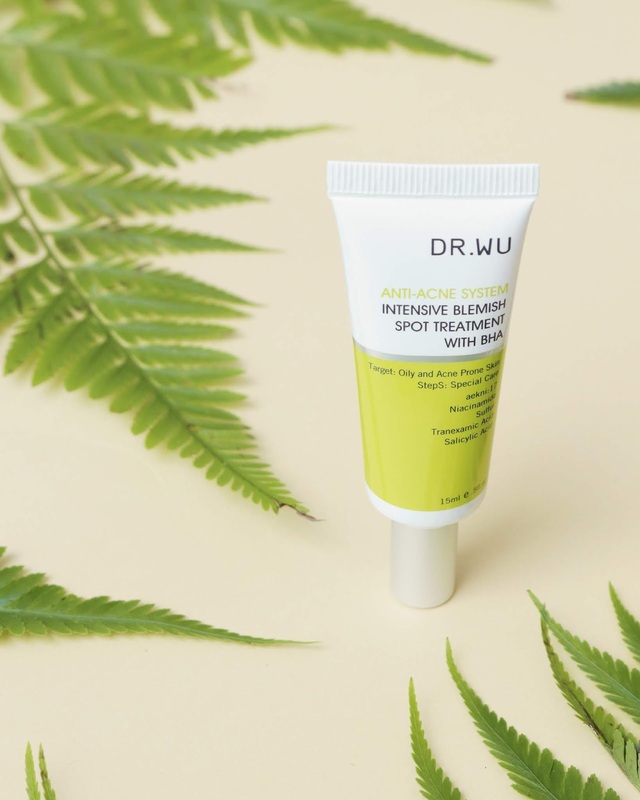 It has a unique serum texture which is mild and can be used on a daily basis. It's slightly yellow in colour and has a slight citrusy scent which disappears after a while. 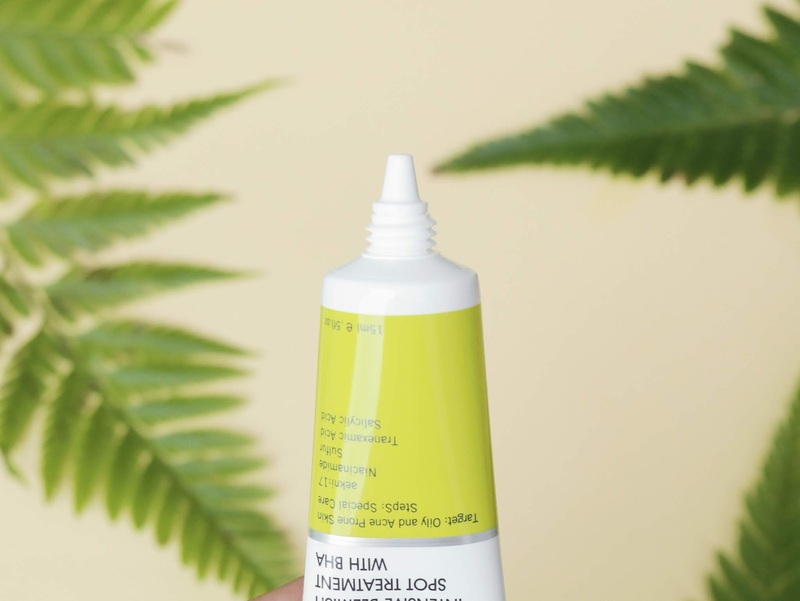 You actually only need to apply the tiniest amount of this product on your face. Apply the product on your trouble areas and you're good to go. I also like how you can apply it on both developing or open/bursted acne without feeling any stinging/unfortable feeling. I use this before moisturizer since it sinks into the skin quite fast. Once it absorbs you can't really feel it anymore in your skin. Overall I think this product is a hidden gem. With so many potent ingredients, it really helps to remove small bumps on my face + make them disappear overnight. The price is a major turnoff at first, but once you use it and see how fast it works, you'll think otherwise! Compared to Benzoyl Peroxide creams, I think this is better because it doesn't dry out the skin or make it more succeptible to further irritation. It really helps to calm your troubles and heal it from the inside. I also like how you can apply it onto open wounds/pimples that popped and not feel any stinging/discomfort. I experienced this once, and it helped to seal thea wound + help it heal pretty nicely. The price point is still a very important thing to factor in. I think if you have extra cash and would like to have a "secret weapon" that you can use to get rid of pimples and acne overnight for an important event, you should definitely add this to your vanity. If you're someone with a limited budget, I suggest investing in multiple products with good ingredients to add to your routine instead. It's definitely a "good to have" item, but not a "must have". And that's it for this review! I hope you found it helpful and informative. See y'all in my next blog post!